In my last post on "What The Location Of Your Acne Is Telling You", I mentioned about how your digestive system plays a role in keeping your skin healthy. 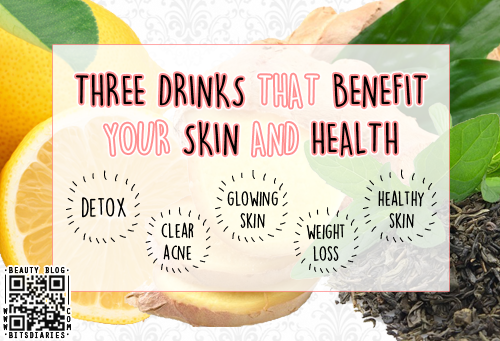 Today, I will be sharing THREE healthy beverages I have personally tried and loved. They help in digestion and also detoxify the body to promote healthy skin. The best part? They are super cheap, quick and easy to make! Lemon is loaded with antioxidant Vitamin C that gives your immune system a boost. Vitamin C also plays a role in wound healing and skin brightening. 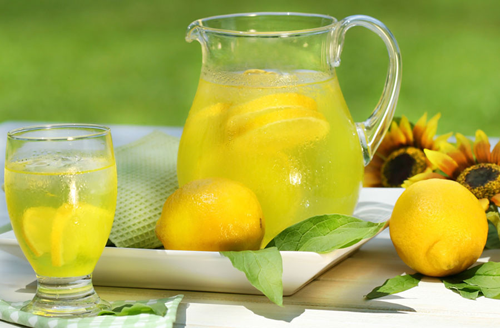 Drinking lemon water increases hydrochloric acid in your stomach aiding in digestion and the absorption of nutrients. It also stimulates the release of enzymes, reduces inflammation and helps to convert toxins into water-soluble form that's easily flushed out from the body. In addition, it aids in weight loss because it is high in pectin fiber, which helps to fight hunger cravings. BE WARNED! Lemon is highly acidic, so routine consumption of lemon juice will erode tooth enamel. How To Make? : It's easy peasy! Just squeeze half a fresh lemon into 8-16oz of water. It can be served warm or chilled. My Way Of Doing It: I find half a lemon is too much for me. So I usually squeeze only one slice of lemon into a cup of warm water (about 200ml). As it is highly acidic and may cause tooth enamel erosion, I don't drink it everyday. When I drink lemon water, I will make sure that I drink it through a straw to minimize contact with my teeth. Ginger has strong anti-inflammatory, anti-parasitic, anti-viral and anti-bacterial properties; and thus, it is proven to be a superfood that have amazing health benefits. The properties of ginger help to kill and prevents ovarian and prostate cancer cells, as well as alleviating the pain caused by rheumatism. 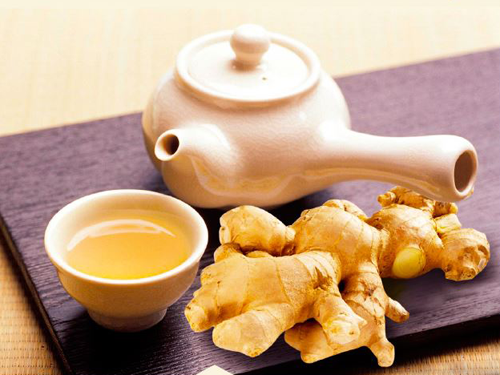 Ginger water/tea is often considered a treatment for digestive discomfort and relieving bloating and nausea. It helps to stimulate digestive enzymes, aiding in digestion and detoxification which support glowing and healthy skin. It also helps to promote warmth in the upper respiratory tract, providing relief for cold and flu. BE WARNED! Do not overdose on ginger because there are side effects such as heartburn, upset tummy (e.g. diarrhea), oral irritations and burping. These side effects rarely occur in low doses, but are a greater threat as dosage sizes increase. So be caution on how much ginger you consume. How To Make? : Simply add a few slices of ginger into boiling water for 10-15 minutes. If you don't like the taste of ginger, you can add some honey and/or lemon to improve the taste. My Way Of Doing It: I will just cut a few slices of ginger and pound it with a pounder/mallet. Then put it in a cup and pour hot water over it. Let it steep for 5-10 minutes before drinking. 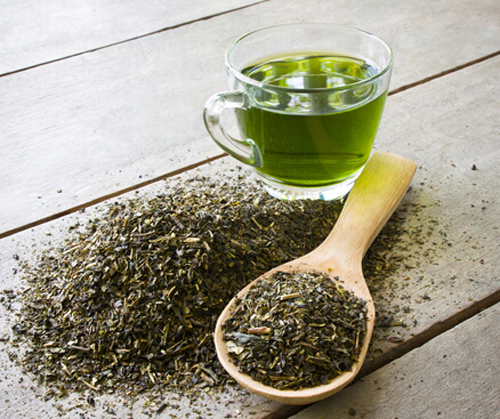 Green Tea has powerful antioxidants and inflammatory properties that benefit the skin and body in many ways. It fights against free radicals, preventing skin aging and reducing the risk of serious health conditions such as skin cancer and heart disease. It also helps to reduce cholesterol levels. Drinking green tea aids in digestion, it also increases metabolism aiding fat burn and weight loss. It helps to ease sagging and puffiness, and combat skin inflammation in the form of redness and blemishes. What's more, it boosts blood flow and oxygen to your skin which supplies your skin with key nutrients to keep your complexion healthy. How To Make? & My Way Of Doing It: For an easy and convenient preparation, get the tea in tea bag form. Place the tea bag in a cup, then pour hot water over it. Let it steep for 3 to 5 minutes or to desire strength. Remove the tea bag and ready to serve! By the way, a tea bag can be reused one or two times. DID YOU KNOW? Tea is effective in cutting grease. So when you are eating oily foods, pair it with a cup of tea.